Warzone has just been updated to version 4.10.0! This update adds a new map rendering engine called UJS-Canvas, as well as some bug fixes. This is a server-only update, which means the Unity app (iOS/Android apps) will not receive this version. UJS-Canvas is a new map rendering engine for players playing Warzone through a web browser on a computer. It is similar to the UJS mode already available, but it renders the map using the html <canvas> element. The goal of UJS-Canvas is increased performance on large maps. In UJS mode, large maps can cause a significant amount of framerate lag. UJS-Canvas aims to fix this by redrawing the map only when you pan/zoom around instead of every frame. This leads to a smoother experience, which helps on maps of all sizes but is most noticeable on large maps. It also has some small visual improvements over UJS mode. For example, when territories bounce, the army number on that territory bounces with them which looks more natural. Also, when territories glow, the glow effect is done much more efficiently than UJS mode which also saves a lot of CPU. This is most noticeable when selecting very large bonuses, such as super bonuses on large maps, which highlight much more smoothly in UJS-Canvas over UJS mode. You can try it right now! Just head to the Change Web Mode page and check the UJS-Canvas option. If you try it out, let me know what you think! – All: Fixed a bug that made community level descriptions not show up in some cases. Thanks to Slovakia for reporting this. – All: Fixed a bug with real-time Quickmatch/Ladder/Tournament games with auto boot times under 5 minutes that could delay the automatic force join. Thanks to Krzystof for reporting this. – All: Fixed a bug with community levels that could cause an error when adding multiple special units to the same territory. – All: Fixed a bug with boss units on community levels that use high fog levels. Thanks to Rucka for reporting this. – Website: Fixed a bug that prevented tournament custom scenarios from being viewed while in UJS mode. – Website: Removed real-time ladder from the multi-player dashboard. – UJS: Fixed a bug that could cause an error message when trying to modify orders. – UJS: Fixed a bug that made hotkeys not work in Firefox after closing chat. Thanks to 89thlap for reporting this. – Unity: Fixed typo in tournament chat. Thanks to Olja for reporting this. – Unity: Fixed a bug that could cause an error if a territory was clicked just as a game ended. Thanks to Drama for reporting this. – Unity: Fixed a bug that prevented joining coin tournaments if you had exactly the number of coins as the entry fee. Thanks to Pohorex for reporting this. – Unity/UJS: Fixed a bug that could cause “bubble doesn’t have a slot” error when loading a template that used custom scenarios then changing the players. Thanks to Johnson Dibbles for reporting this. Warzone is 1 year old! One year ago today Warzone was born! We’ve come a long way in the last year. Most of the year was spent on fixing bugs and issues, most notably the UJS client. Thankfully, we did fit some new features in as well with a graphics overhaul, quickmatch leaderboards, tournament byes, tournaments in the mobile app, and continued improvements to the mod system. I’m happy to report that this game is in the best place it’s ever been. The game is more stable and reliable than ever before, and we can finally say it doesn’t rely on any outdated technologies! (Except map design…) Plus we finally have one UI that runs across all devices (iOS/Android/Web), which we’ve never had before. This means that, going forward, you should expect to see more features and improvements to the game than ever before. Warzone is not a one-off game like is so common in the games industry, where a company finishes a game and moves on to a new one. Warzone is my full time job and I intend to relentlessly pursue improvements to it for as long as I can. I’d love to continue improving it for the rest of my life, if I can. Over the last two weeks, I’ve been working on something that will make UJS users happy. Stay tuned to the blog for an announcement. I want to thank everyone in the Warzone community for everything. I don’t say it often enough, but you all rock. Warzone has the best community of any game I’ve been a part of, and you are all a big part of what makes the game awesome. Warzone’s future is bright, and I’m thrilled to go on this journey together! 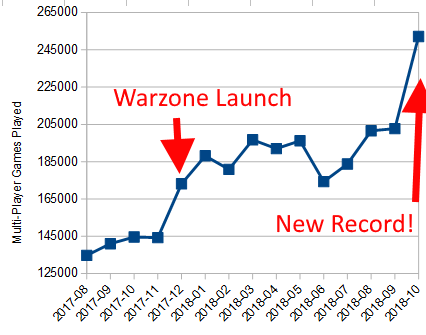 Author FizzerPosted on November 13, 2018 7 Comments on Warzone is 1 year old! Warzone has just been updated to version 4.09.3! This update fixes several bugs and makes some tweaks to tournaments. This blog post describes what’s changed. This a server-only update (meaning the Unity client + apps won’t receive this version). – All: Fixed a bug with the army cap that made your displayed income in the lower right corner show incorrectly after committing your turn. – All: Coin tournaments now show in the settings how many extra coins the creator provided towards the tournament prize. – All: When providing 500 or more extra coins to a tournament, the creator can now set any entry fee they want. Thanks to B for the suggestion. – All: Reduced maximum start time of multi-day public tournaments to 1 day to ensure they start quicker. – UJS: Fixed a bug when a mod crashed that would cause the error message to not be visible in some cases. – UJS: Fixed the way partial cards render in Edge and Internet Explorer: since they can’t display masked cards it will simply fade them out instead. – Unity/UJS: Fixed a bug when a mod passed a non-function when a function was expected that caused it to get a generic error dialog instead of a Mod Crashed dialog. Thanks to Meop for reporting this. – Unity/UJS: Fixed a bug that allowed the quickmatch leaderboard category dialog be opened multiple times. Thanks to TBest for reporting this. – Unity: Fixed a bug that could make white territories overlap a map. Thanks to ViralGoat for being the most recent to report this. – Unity: Fixed a bug when a mod called GetTurn() with a floating point number. Thanks to kevin#1 for reporting this. – Unity: Fixed a bug that could, in rare cases, cause some new maps to fail to be converted into Unity format. Thanks to Goldtank for reporting this. – Website: Changed the way app redirects work again so that it’s a better experience for devices without the app installed. – Website: Fixed color of the wiki link when viewing the settings of a tournament that has highlighted settings. Thanks to number for reporting this.